In a move that will affect every company that uses a website to do business, the Information Commissioner’s Office (ICO) announced last week that they would be extending the deadline for companies to comply with new, stricter cookie regulations – where website visitors will have to opt in before tracking codes can be used to monitor their online behaviour. Using Cookies is the way most companies track website visitors, providing a wealth of information about its customers – as detailed as the type and number of items that a customer is putting into a website shopping basket, for example. 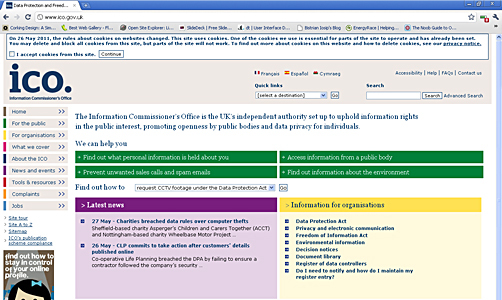 While all UK websites are expected to start planning this implementation now, the ICO is giving one years grace for sites to comply (as of 26/05/11) before fines start to be enforced (of up to £500,000). The ICO even admits, exactly how to go about getting this permission will be ‘challenging’. Decide what solution to obtain consent will be best in your circumstances. In the coming months, we are faced with the challenge of how to facilitate this ‘opt in’ approach, without deterring visitors and attempting to maintain an insight into users behaviour. The likes of Google, Facebook and Amazon, who all rely greatly on the user insights cookies deliver, are yet to announce a strategy on how they will react to this new ruling. It will be interesting to see how they respond to such a controversial piece of digital legislation, especially with Google Analytics being one of the most widely used tools to track website visitors. Stay up to speed with developments on the Cookies law here at the WebPraxis blog. For more information, see the articles at the following sites; Financial Times, The Register.